Working for Neema House is very fulfilling coupled with various interactions it continually presents with the community. Children who would otherwise not be taken in by other institutions (owing to their medical conditions) have found love and a place of refuge in our care. Besides, Neema House has continued to reach out to families in a bid to prevent possible child abandonments by offering the necessary support thereby retaining the children into their original families. This is indeed unique! Watching God place our children into their forever families gives me a lot of joy be it adoption or otherwise following a much-needed intervention. I foresee Neema House and the entire P82 at large grow into becoming a global learning and care Centre for all deserving cases. Secondly, I pray that P82 never deviates from its primary objective of nurturing the Kenya’s vulnerable children holistically to achieve sustainable family solutions. 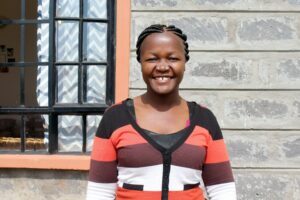 Rhoda, a caregiver and social worker at Neema House, has been writing articles for the local newspaper in Laikipia County, where the Neema House is located. We are so proud of Rhoda and her heart for these precious little ones. Here is her latest article. Support caregivers like Rhoda during our Christmas in Kenya Event. $38 provides for a gift for our caregivers and staff, plus a Christmas Celebration on the first Saturday in December for all the children, guardians, and staff of Project 82 Kenya.